Kiwis Need Their Beauty Sleep, Too! Kiwi fruit facts reveal that kiwifruit is a great type of fruit to have if you are worried about calories. An average sized kiwifruit, which weighs around 2.7 ounces, has only 46 calories and contains just 0.01 ounces of fat. If you prefer to do the math in cups, one cup of kiwifruit has around 108 calories; only 7.7 of those calories are from fat. The rest are from carbohydrates (93.5 calories) and protein (6.8 calories). But kiwifruits are not only an excellent choice calorie-wise: an average-sized kiwifruit also contains around 0.09 ounces of dietary fiber, which is very important for the proper functioning of your digestive system. Apart from that, kiwi seed oil is also full of other great stuff, such as alpha-linolenic acid, an omega-3 fatty acid, a number of carotenoids, and many other substances that your body simply cannot do without. Previous kiwi fruit facts have already shown that kiwis are incredibly low in calories and high on many other nutritious substances, of which vitamins may be the most important ones of them all. Vitamins are organic compounds that our bodies need to sustain life, and kiwi fruit facts show that kiwis are loaded with them. A cup of kiwi contains 3% of our recommended daily intake of vitamin A, 273% of vitamin C, 13% of vitamin E, 89% of vitamin K, 3% of thiamin, 3% of riboflavin, 3% of niacin, 6% of vitamin B6, 11% of folate, and 3% of pantothenic acid. Even though kiwis do contain lots of carbohydrates, kiwi fruit facts reveal the simple truth that kiwis are nonetheless a great choice for your diet. Unlike many other types of fruit, they have a low glycemic index, which means that they won’t cause a strong insulin rush in your body. Fruits that have high sugar content do just that, which leads to your body storing fat. Kiwi fruit’s glycemic index is only 52, which places it in the moderate to low glycemic index group. This is great news for anyone who loves kiwi, and wants to avoid the sugar rush that usually comes with other types of fruit. It is also great news for people with diabetes; due to their low glycemic index, kiwifruits eaten in moderation should also be safe for diabetics. Kiwi facts reveal that there is a wide variety of different kiwis: some are more similar to what we imagine when we think of kiwifruits and some are much further from that image. But all kiwifruits belong to the same genus called Actinidia, which contains around 60 different species. The most common of these species is the species A. deliciosa, which is also known as the fuzzy kiwifruit. Other species that are among the most popular are the golden kiwifruit (A. chinensis), the Chinese egg gooseberry (A. coriacea), the baby kiwifruit (A. argute), the Arctic kiwifruit (A. kolomikta), the red kiwifruit (A. melanandra), the silver vine (A. polygama), and the purple kiwifruit (A. purpurea). When you think of a kiwifruit, you probably envision a small, round, green fruit – but kiwi fruit facts reveal that this is not necessarily correct. Kiwifruits come in all sorts of shapes and sizes; their skin can vary in size, shape, hairiness, and color, and their flesh can vary in color, juiciness, texture, and taste. The taste can differ significantly in fact: some fruits are very tasty to humans, while others were clearly not created for eating. Most of the kiwifruits eaten around the world are fuzzy kiwifruits; they have a fuzzy, greenish brown skin and bright green flesh. The most commonly available cultivars include Hayward (large, egg-shaped fruit with a delicious sweet flavor), Saanichton 12 (comes from British Columbia, has a slightly more rectangular shape and is just as sweet, although the inner core of the fruit can be a bit tougher) and Blake (fruit of a smaller, more oval shape that doesn’t taste quite as delicious as many other kiwifruits). But kiwifruits can also look significantly different. For example, kiwi berries are small, berry- or grape-sized fruits. They are edible and have a similar taste and appearance to normal kiwis, but have smooth skin. They grow very quickly and are known by a variety of names such as kiwi berry, baby kiwi, dessert kiwi, grape kiwi, or cocktail kiwi. These smaller kiwis are mainly produced by three species of kiwifruits: the hardy kiwi (Actinidia argute), the Arctic beauty (A. kolomikta), and the silver vine (A. polygama). Golden kiwifruit is another species that is significantly different from what we most commonly imagine as a kiwifruit. Actinidia chinensis, as this species of kiwifruit is also called, has smooth, bronze-colored skin, and the color of its flesh can range from the typical bright green kiwi color to a clear, intense shade of yellow. Golden kiwifruits are much sweeter and more aromatic – they taste similar in flavor to some tropical fruits. This species is usually more expensive than normal kinds of kiwifruits, but it also has a shorter storage life, which is probably one of the reasons why it isn’t as commercially available worldwide. Kiwi fruit facts show that this yummy type of fruit originally came from China; the north-central and eastern parts of the country, to be exact. After a long period of being cultivated only in China, kiwifruits spread to New Zealand in the early 20th century. It was there that the first commercial plantings began to develop, and kiwi fruit facts show that kiwis soon became very popular among the American servicemen stationed in New Zealand during World War II. Back then, kiwifruits were still called Chinese gooseberries, which was a result of their origin as well as their flavor and the color of their flesh. However, in 1962 the growers in New Zealand gave them their new name, kiwifruit, to give them a greater market appeal. The name caught on quickly, and was also used to introduce the fruit to the American market. Nowadays, over 70% of all kiwifruit production takes place in Italy, New Zealand and Chile, with Italy producing around 10% more kiwis than New Zealand and Chile producing around 40% less. China, as the homeland of kiwifruits, was not a major producing country until recently; this is because kiwifruits in China were traditionally collected from the wild, mostly in the mountainous area of the Yangtze River and Sichuan. Nowadays, we think of them as a tasty snack, but kiwi fruit facts make it very clear that they have had many other uses over the years. In China, where kiwifruits originate from, they were traditionally given as medicine, mainly to children to facilitate their growth, as well as to women who had recently given birth, in order to speed up their recovery. Kiwifruits are also used in a variety of other ways. Raw kiwifruits, for example, are rich in a protein-dissolving enzyme called actinidain, which is commercially useful as a meat tenderizer. However, the presence of this enzyme in kiwifruits is also what makes them unsuitable for use in dishes that contain milk or other dairy products. If these dishes are not served immediately, the enzyme starts to digest the proteins in the milk, destroying the texture of the dish. The same goes for gelatin-based dishes; the enzyme dissolves the proteins, which can liquefy the dish or prevent it from solidifying in the first place. However, there is a solution: if you cook your kiwi fruits for a while before adding them to gelatin- or dairy-based dishes, the enzyme should be disabled. Just as with many other types of fruit, you have to know what you are looking for when selecting kiwis to buy, and you also have to know how to store them once you bring them home. The best way to select perfect kiwi fruits for your pantry is by holding them between your thumb and forefinger and gently applying pressure – the sweetest kiwis, which are perfect for consumption, will gently yield to the pressure. However, they must not be too soft since this is a clear sign that they are simply too ripe. Contrary to popular belief, the size of a kiwi is not related to its quality, so you can simply pick the ones you like the most. When deciding how to store kiwis, you must first determine their ripeness. If they are not yet fully ripe, it is best to leave them at room temperature for a couple of days, but make sure that they are not exposed to direct sunlight or heat. If you want them to ripen more quickly, place them in a paper bag together with an apple, a banana or a pear. Once your kiwis are ripe, store them at room temperature or in the refrigerator. We all know that kiwis are a great fruit, but kiwi fruit facts reveal some delicious dishes and unconventional combinations that kiwis can be a true star in. If you decide to eat your kiwis raw, you can peel them or eat them together with the skin; contrary to popular belief, the skin of kiwi fruits is edible. However, kiwis should not be cut in slices or pieces too long before serving as they tend to go soft quickly after they are cut. Kiwi fans all around the world often eat kiwi fruits in fruit salads, and sometimes even add them to ordinary green salads. Kiwi is a great choice for fruit chutneys (usually together with oranges and pineapples), it can be blended with cantaloupe in a food processor to prepare a lovely chilled soup, or it can be used in stunning fruit tarts. Kiwi fruit facts reveal that kiwifruits contain another important substance, which is especially important during pregnancy. It is called folic acid and it is needed to prevent neural tube defects in babies, as well as facilitate brain and cognitive development in children. Many pregnant women take folic acid as a supplement during their pregnancy, but kiwi fruit facts show that eating enough kiwifruits could probably be just as efficient in providing the body with all the folic acid it needs to guarantee healthy baby development. What is the first thing you think of when you hear the world kiwi? If it is the greenish-brown fruit of outstanding taste, you are definitely not alone – but there are many others who first think of other things. For example, in New Zealand, one of the first countries that knew and loved the kiwi fruit, the word kiwi does not usually refer to the fruit, but to either the kiwi bird, a small flightless bird, or to the people of New Zealand, who are also called kiwis. Want to know who got their name first? Kiwi fruit facts reveal that the fruit was named after the bird, mainly because their appearance is quite similar – both of them are small, furry and brown-green in color! Kiwi fruit facts reveal that some people are allergic to kiwis and therefore cannot enjoy their amazing taste. The main substance to blame for this is actinidin, which is a known allergen for some people, but kiwi fruits also contain calcium oxalate crystals in the form of raphides, which can also cause allergic reactions. And how do kiwi fruit allergies present? The main symptoms of kiwi fruit allergies include a tingling, sore mouth and throat, sweating, swelling of the lips, tongue and face, vomiting, belly pain, heartburn, and, in some extreme cases, also breathing problems, wheezing and even collapse. For most people who suffer from kiwi-related allergies, however, symptoms do not go any further than a slight sore mouth and unpleasant itchiness, but in young children, some more severe symptoms can appear. We already know that kiwi fruits can cause allergies; however, kiwi fruit facts reveal another, even more surprising fact – people who are allergic to kiwi fruits are also likely to be allergic to latex. This phenomenon is called the latex-fruit allergy syndrome and it is probably one of the most fascinating syndromes in the world of medicine. Kiwi fruit facts show that kiwis have another amazing power – they can help protect your DNA from oxygen-related damage. Phytonutrient research done in the past couple of years has shown that there are certain compounds in kiwi fruit that give this magnificent type of fruit special antioxidant properties. The researchers are not yet completely sure which compounds exactly are responsible for this, but they are sure that the kiwi’s healing powers are not limited only to antioxidants found in a variety of other types of fruits. Kiwis contain a number of other flavonoids and carotenoids with demonstrated antioxidant activity, so these substances could likely be the ones behind the kiwi’s DNA-protective properties. It is well known that a decent amount of fruits and vegetables in the diet is of utmost importance for the efficient functioning of the digestive system; however, kiwi fruit facts reveal that kiwis could play an even more important role than most other types of fruits and vegetables. This is because they are a great source of dietary fiber, which also brings a number of other benefits. Research has shown that diets with plenty of fiber can help reduce high levels of cholesterol, which consequently lowers the risk for heart disease and heart attack. Fiber also plays an important role when it comes to binding and removing toxins from the colon, which can in turn help prevent colon cancer. Fiber has another great characteristic: it helps keep blood sugar levels under control, which is especially beneficial for people with diabetes. Kiwis and asthma may have absolutely nothing in common at a first glance, but kiwi fruit facts reveal that these small green fruits might actually have more super powers than we can even imagine. Research has shown that fruits rich in vitamin C (such as kiwis) may have a beneficial effect on respiratory symptoms caused by asthma, such as wheezing. Italian studies carried out on over 18,000 children aged 6-7 years old have shown that those who ate the most citrus and kiwifruits had far fewer problems with wheezing; they actually had a 44% reduced incidence of wheezing compared to kids who ate fewer kiwifruits. Wheezing was not the only symptom of asthma that was significantly improved; shortness of breath was reduced by 32%, night coughing by 27%, chronic coughing by 25%, and a runny nose by 28%. Cardio-vascular diseases are one of the leading health issues of modern world and kiwi fruit facts reveal that this magical fruit could possibly play an important role in the prevention of these diseases. Research has shown that eating a couple kiwifruits daily could significantly lower the risk of developing blood clots as well as reduce the amount of special form of fats, called triglycerides, in the blood. All this could help protect your cardio-vascular health and thus help prevent the development of cardio-vascular diseases. One study found that people who ate 2 – 3 kiwi fruits per day for a period of 28 days reduced their potential for forming blood clots by a whopping 18% in comparison to participants in the control group who did not eat kiwis. In addition, their triglyceride levels also dropped by 15%. Just when you thought that kiwi fruits couldn’t possibly have any more super powers, there they go proving you wrong! Kiwi fruit facts reveal that they can actually make your skin look more beautiful. This is because collagen, the substance that supports our skin, relies on vitamin C to help keep it healthy and functioning efficiently – the more vitamin C you ingest, the better your skin will look. However, kiwi fruits also give your skin a shinier, relaxed tone, as they help you sleep better. 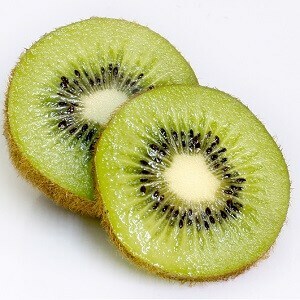 Research has shown that consumption of kiwifruits is closely connected to the quality of sleep, and that regular kiwi consumption could actually improve the duration and efficiency of sleep, which consequently also improves your looks! With all the super powers that kiwi fruits have, you might think that they do not need beauty sleep themselves – however, kiwi fruit facts reveal that they actually do need it. The vines on which kiwi fruits grow enter a dormant period every year, and enjoy their winter sleep from early December until March. And, even once the vines wake up, kiwi fruits take their sweet time to grow; their growing period is relatively long in comparison to many other types of fruit. Kiwi fruits also need a nice, warm environment in which to grow: if they do not get at least 200 days without frost, they will not grow to become the yummy, sweet fruits we all know and love. While kiwi fruits are definitely one of the best types of fruit around, they can also have some adverse effects that can be anything but pleasant. Kiwi fruit facts show that eating kiwifruit can cause mouth irritation if your mouth or tongue is sensitive. Another unpleasant effect of eating kiwi fruit can be diarrhea; since kiwis are incredibly rich in fiber, they speed up your digestion and can be used as a natural remedy for constipation. Unfortunately, sometimes they are too efficient and they can cause unpleasant diarrhea. The kiwifruit, nicknamed the Chinese gooseberry, is a member of the genus Actinidia. The most common species of kiwifruit include A. argute, A. chinensis, A. deliciosa, A. eriantha, and A. indochinensis. Kiwifruits are botanically berries and they are native to north-central and eastern China. From there, they first spread to New Zealand and later all over the world. Today, they are grown in many parts of the world and fare best in temperate climates with adequate summer heat. They were first introduced to the US in 1962. Major producers of kiwis today include Italy, New Zealand, Chile, and Greece.